Adi Dasseler, founder of adidas put two decades of his life into recreating, innovating and crafting some of the most iconic sneakers we know today. The brand was founded officially in 1948 with the aim to provide some of the best footwear to athletes around the world. An instant hit, adidas came out with a range of sneakers that coined the word ‘Sneakerhead’. The Ecstasy, Half Shell, Stan Smiths and the adidas Gazelle shoe have been some of the crowning jewels in the brand’s roster. Inspired by the principles of field and track, the adidas Gazelle shoe was launched in 1968. Celebrities, fashion houses, street style enthusiasts and even athletes got their hands on the adidas Gazelle OG and ever since it has become a part of pop-culture. Introduced as a training shoe, the adidas Gazelle OG can be paired with just about anything – denims, casuals, trousers, skirts, shorts etc. 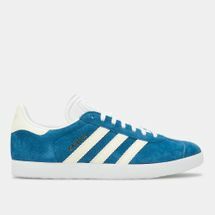 One of the most unique features about the adidas Gazelle shoe is that it has retained its silhouette despite the innovations, design revamps and colour changes. 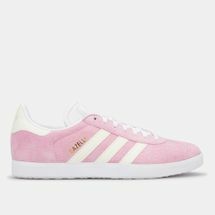 Here at Sun & Sand Sports, we bring you closer to the coolest adidas Gazelle women’s shoes and the trendy men’s adidas Gazelle collection so that you can own this classic piece and get it delivered straight to your doorstep.